Finished making my lamp. 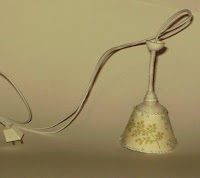 The lamp shade is made with fabric and trimmed with white thread that I made into a cord. The light was a plain dollhouse light that with a little DIY looks much brighter ; If you'll pardon the pun :) . The 'cup' at the top was made using white fimo. I am making two smaller ones for the back wall. All I need to find now, is a transormer for Europe that will light it.